This little quilt is my somewhat quirky interpretation of the Early American Flying Geese quilt pattern. As with most of my work, it is made from repurposed materials. 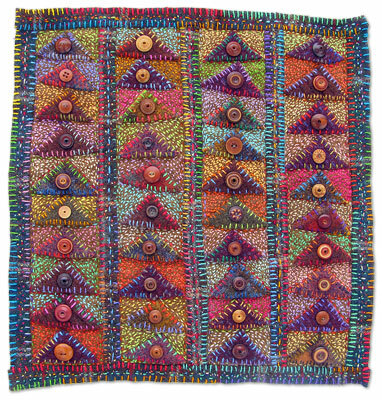 The triangles are made from a multitude of old wool sweaters, which I recycled into beautiful, thick felted wool. The background and borders are from vintage blankets. It is lavishly stitched with wool tapestry thread and embellished with an array of vintage vegetable ivory buttons. The finished back is dated (2010) and signed. I have worked on Flying Geese over a period of several years. It has become a venture in “slow cloth.” Slow cloth (a term coined by author Elaine Lipson) describes an approach to working with and relating to fiber and textiles. I first declared Flying Geese "finished" in 2007. But after living with it on the wall in my studio, I realized I was bothered by a feeling of “not-rightness.” It was too dark and too monochromatic - both qualities I had intended, but they didn't translate from mind to material the way I had wanted them to. Eventually, I picked up the piece and added stitching on all the border strips and around the perimeter of each triangle. That was better, I thought, and so I declared it "finished" again. But, I was soon to realize it still didn't satisfy. The triangles looked fine, but the background (an Army blanket) was dead negative space. I embroidered a single, colorful French knot on each background triangle. Once again, I thought it was "finished" and I put it up for sale. But still it called to me to do something more. The more I looked at it, the more I was convinced that all those background triangles need to be filled with stitches. I resisted for a long time because it seemed like it would be so much work. Then, one day, out of the blue, my mind did a complete turnaround. I thought, “Wouldn’t it be incredibly fun to add all those tiny stitches!” Suddenly, I found myself approaching it differently. It wasn’t work; it was pleasure. And that's what makes this slow cloth, not the fact that it is took so long. Slow cloth isn't about duration. Slow cloth is about a way. Now, I feel certain that Flying Geese is complete.